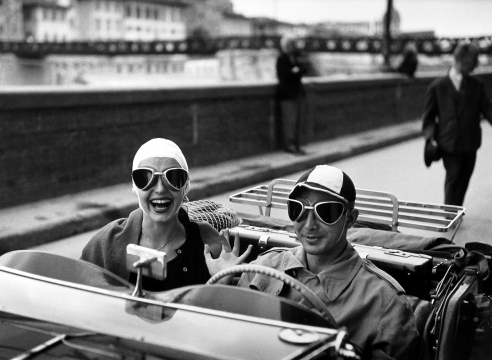 Howard Greenberg Gallery is pleased to announce an exhibition that reveals the making of Ruth Orkin’s American Girl in Italy, one of the most widely known photographs ever taken. Co-curated by Orkin’s daughter, Mary Engel, the exhibition will feature rarely seen photographs from Orkin’s travelogue of images that encapsulate the tourist’s experience in Italy. The show pays tribute to the efforts and talents of two women – photographer and model. The original model for American Girl, Jinx Allen, or Ninalee Craig as she is known today, will be in attendance at the gallery’s opening reception. On August 22, 1951, on the Piazza della Repubblica in Florence, photographer Ruth Orkin snapped the photograph that made her famous. The image, of a young woman walking through a thicket of men, was considered risqué in its time. Since then it has become one of the most famous and controversial pictures ever taken, reproduced in countless posters, books, magazines, calendars and postcards.